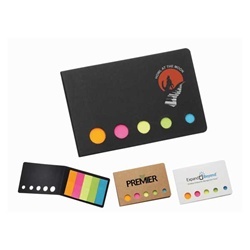 Promotional Accent Sticky Flags Booklet is made of 100% paper material. Personalized Sticky Flags Booklet is designed with 5 bright-colored sticky flags. Promotional Accent Sticky Flags Booklet is available in 3 colors: Black, Tan, and White.